When the Atlanta Thrashers franchise moved to Manitoba and became the Winnipeg Jets, it did so with the prospect base in an interesting position. There were a large number of young players developing in the team or on the edge of the team, who have now become veterans on this current roster, but a very thin prospect base beyond that. Consequently, the Jets ranked 29th in Hockey Future Magazine’s latest team prospect rankings. This is a pretty concerning statistic for a franchise that hasn’t made the postseason since the 2006/07 season. The reality is that General Manager Kevin Cheveldayoff has a lot of work to do as he aims to re-stock his team’s cupboards. Here’s a look at the Winnipeg Jets’ top five prospects. Having said that Winnipeg’s prospect base lacks depth, it should be noted that they clearly have at least five (they actually have more) very good prospects based on the fact that Telegin has been placed at #5 on this list . A fourth round pick from the 2010 NHL Entry draft, Telegin is an unusually unheralded Russian forward. The big forward put up strong numbers in the OHL by playing a North American style of game. Telegin puts his body in front of the net and creates offense with hard board work. He has pretty decent skating speed and uses his size at both ends of the ice. Telegin has just nine points in 34 games during his first stint with the St John Ice Caps in the AHL, but don’t expect it to take too long for this player to make a mark at professional level. Redmond often gets under-rated because he doesn’t possess obvious top end skills. However, just about everything that the 24-year old has done in the NCAA, AHL and recently NHL has been extremely simple and extremely effective. He is a very effective transition player as a smooth skater and nice passer. He can quarterback the power-play effectively and has a nice shot that he knows how to use. Defensively his all-round skating makes him an effective player and he knows how to position himself efficiently. He is perhaps a little guilty of not using his big body to its maximum potential. Redmond has played very nicely for Winnipeg so far in 2013 and should soon make himself a fixture on the Jets’ blue line. Klingberg is one of the more interesting members of Winnipeg’s prospect base. He has a ferocious work ethic and is a fantastic skater. He was one of the more intriguing Swedish imports last season and showed some potential playing with the AHL’s St. Johns’ Ice Caps. In 2011-12 he scored 15 goals and 37 points in 66 games. He has struggled to back that up so far in 2013 scoring only 18 points through 49 games, but there’s little doubt that he is NHL ready physically and can keep up in the top league with his skating. It seems certain that Klingberg will make it at NHL level even if it’s as a third/fourth line winger. He likes driving to the net and is strong on the forecheck. The 22-year old has some work to do on his overall offensive game though. Scheifele is perhaps the perfect example of a forward ineligible to play in the AHL, who could really do with some time in the AHL. The 19-year old has dominated the OHL, but has failed to establish himself in 11 NHL games over the past two seasons. Most expected Scheifele to make the jump in 2013 after being afforded extra development time in the AHL, and after coming so close to cracking the line-up in 2011-12. Winnipeg’s line-up is a little crowded with skilled forwards and Scheifele’s all-round game was still found lacking in his four appearances for Claude Noel’s team once again the shortened season. 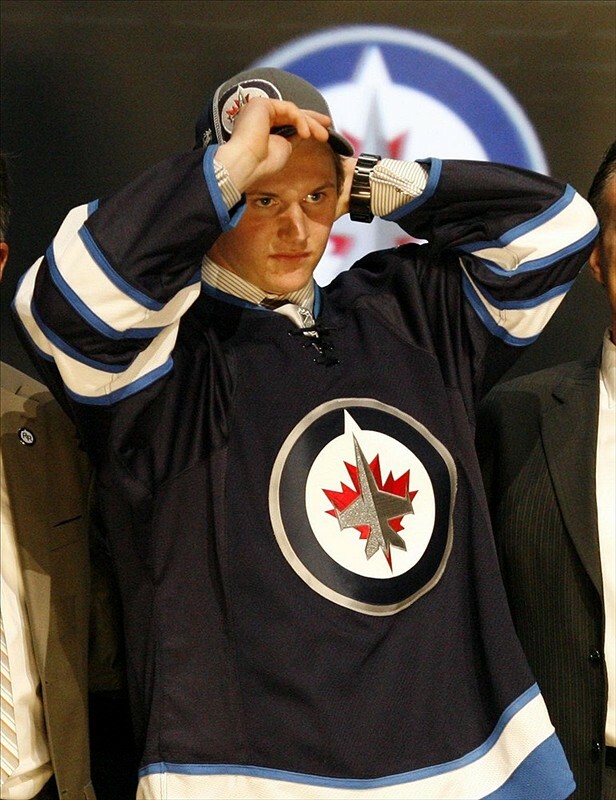 Still, there is no reason to doubt that Scheifele will develop into the top center that Jets’ fans are hoping for. He has speed, skill, a high hockey IQ and a well-respected work rate to go with those tools. The recent trend of young forwards making an instant jump has set the bar very high, but there should be no doubts that Scheifele is a player who should still fulfill his high-end potential. Scheifele usually receives this honor due to the fact that he has experience at NHL level. However, Trouba is a player who definitely deserves a lot of credit, and he has the potential to be a huge piece of a future blue line alongside Tobias Enstrom, Dustin Byfuglien and Zach Bogosian. Trouba’s reputation is as a hard-hitting, gritty and physical defenseman. He could do with adding a little more weight, but he has already shown that he is more than willing to mix it up and use what size he has. Trouba is also an excellent skater and has the quickness and agility to open up angles for an effective shot. He didn’t quite perform as expected, at least not offensively, at the World Junior championships despite playing for the Gold Medal winners. This 18-year old might be a two or three years away from having an impact at NHL level, but he has the highest impact potential out of any player in the Winnipeg Jets’ prospect base.